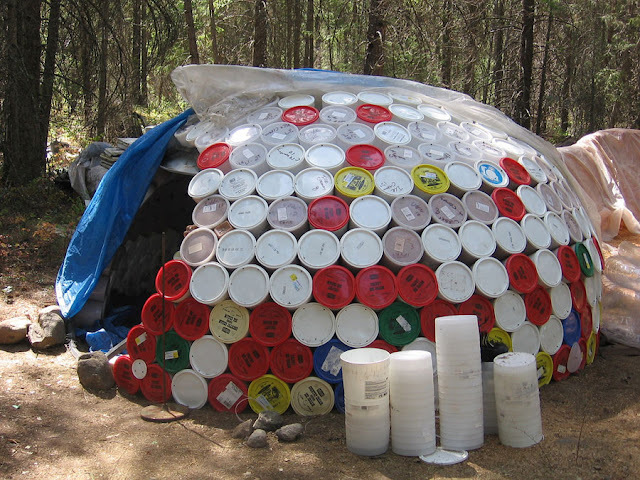 It's always amazing to see what people can do with 5 gallon buckets. First of all, we just LOVE the idea of not throwing away 5 gallon pails for any reason. Secondly, it's hilariously fun to see how creative people can be with them. Today's blog post is about 5 gallon bucket igloo posted on www.tinyhouseswoon.com. Look at the picture. Isn't this marvellous? You've heard the multi function uses of 5 gallon pails before in the form of camping tools, furniture, etc. but a structure like this is surely worth noting. And trying maybe, if you have the time and energy to do the project. Thumbs up for these bucket igloo maker(s)!